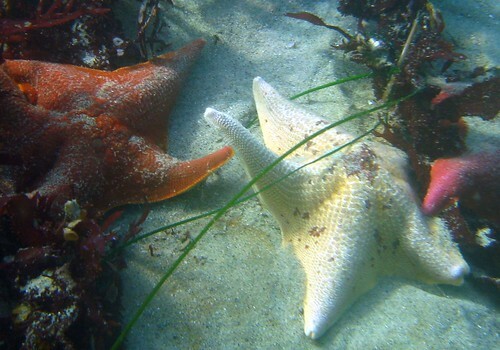 The Echinoblog: Starfish Bouts!! Behavior REVEALED!!! Photo by Dida K on Flickr! "Do Starfish EVER move? "Are those sea stars alive?" These are ACTUAL questions I have been asked by the public. Probably the most characteristic aspect of starfish biology is defined by something that most of us don't regularly see. Movement. Its important to realize how important understanding movement can be. We often identify "living things" by recognizing if they move. We perceive behavior from how they move. Starfish are animals. And they DO MOVE. BUT they do so at a much slower rate and we humans generally require video assistance in order to recognize that they do. Its kind of like that old Star Trek: TOS series episode "Wink of an Eye" where the crew runs into aliens that are hyperaccelerated because of the water present in the alien planet. Here, Spock samples the water becoming hyper-accelerated and watches McCoy and Nurse Chapel slow down. McCoy and Chapel are the "slow" starfish. They talk and interact normally among themselves but are slow compared to hyperaccelerated Spock! We move in a different, faster time frame than starfish. They seem very slow (perhaps even sitting still)-but in fact they are doing everything normally IN THEIR WORLD at their rate of time. 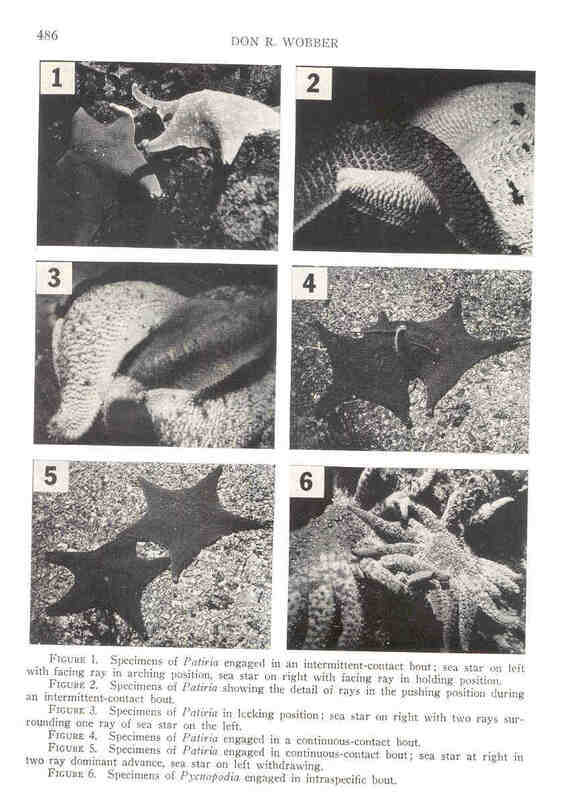 A key paper from 1975 by a young marine biologist at San Francisco State named Don Wobber was the first to observe sea stars using cameras and SCUBA diving. His paper was published in the Biological Bulletin and is available here for free! Field observations resulting from about 240 hours of scuba diving between 1971 to 1974 were done in a 75 X 40 m study area....Undersea observations were recorded on plastic writing boards and by still or motion pictures, the latter augmented with time lapse series analyzed frame-by-frame. That is a LOT of time watching starfish! 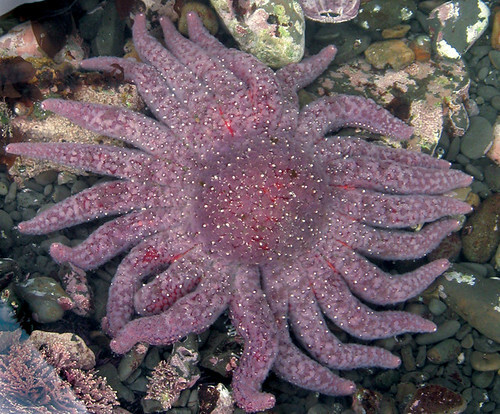 He complimented field observations with lab studies with various California starfish motivated by food and the presence of other starfish species..
Wobber identified that starfish ARE behaviorally complex. They display a wide range of discrete movements which one observes between any number of different individuals. Sometimes between members of the same species and sometimes between members of different species. But he found a huge array of different movements, which again could vary among and between different species. Basically that the arms could push back and forth between multiple individuals. These little sessions were termed "bouts"..kind of like fighting/pushing back and forth. Bouts between bat stars (Patiria miniata) were often related to food gathering. Bouts could last anywhere between 3 to 120 minutes. Sea stars demonstrated "win" in bouts where they were familiar with the home area versus bouts where individuals were unfamiliar with the area. This implied that these animals might show "home advantage" in interactions against non-familiar individuals. Lifting-raising the ray to a position above the top surface of the opponent. Holding-holding the ray in a position over the top surface of the opponent. Feinting-Slight lowering and raising of the ray when in the holding position. Pushing-forcing of the arm tip of a ray against the distal end of the ray of the opponent, often folding the tip of the ray over the opponent's ray. Locking-surrounding and pressing in of two rays of one animal onto another animal. 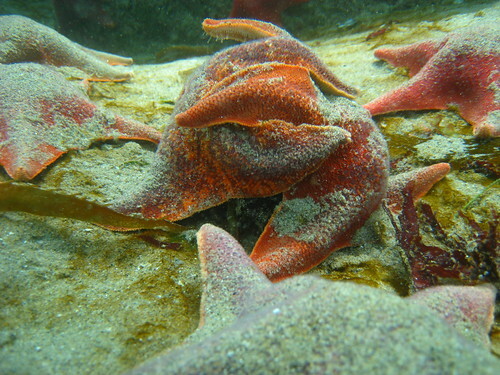 (two or more bat stars in locking positions will often share the same food item). Does all of sound a little familiar? 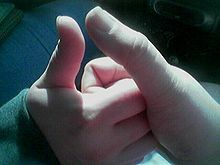 The behaivor does seem superficially simlar to "thumb wrestling"! A ray movement position unique to Pycnopodia is side-slipping, the semi-horizontal sliding of rays between, then over and onto the rays of the opponent, sometimes accomplished by a rotating of the whole body clockwise or counter-clockwise. Pycnopodia did not engage in feinting, pushing or locking positions. Different 'bouts' could result in different outcomes including "wins" (advantage), "losses" (disadvantage) and the "ties" (neutral). 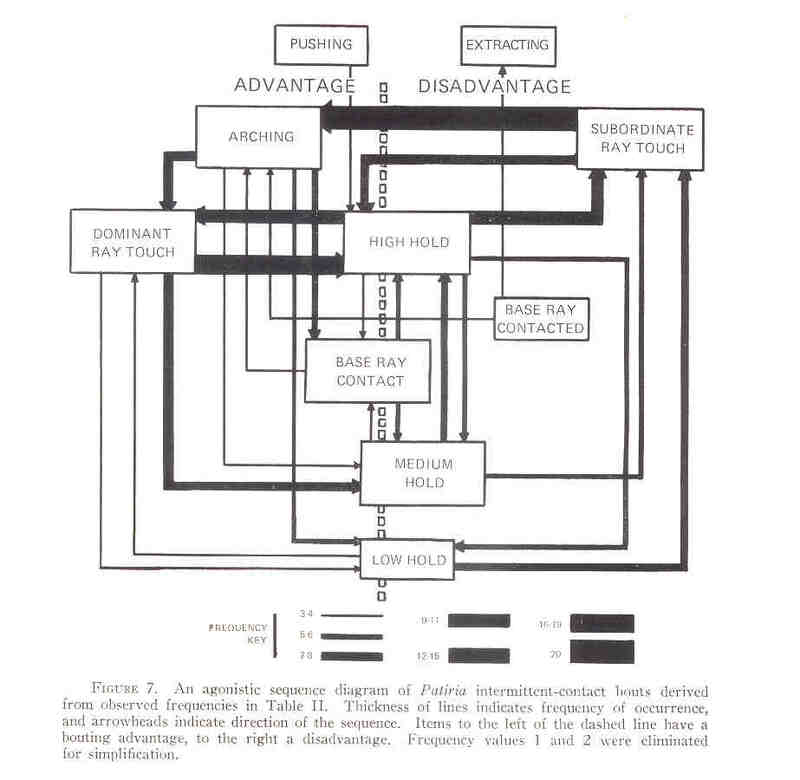 Different factors could affect each the advantage or "win" of each interaction, including greater size of an individual, position of the madreporite and so on. 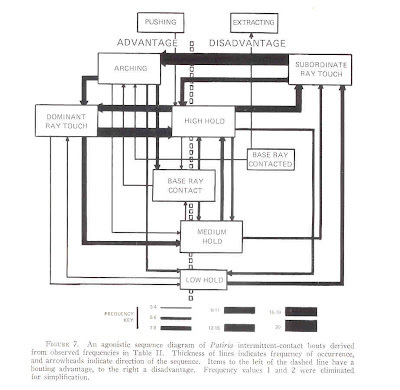 A summary diagram of the many complicated interactions is shown below (from Wobber's Figure 7). Thick lines indicated how frequently a particular behavior occurred. Arrows indicate direction of a sequence of actions. 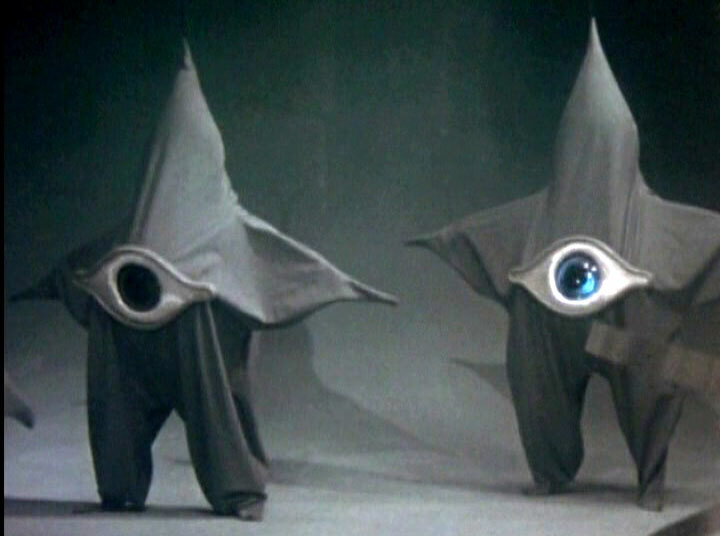 When large food sources were placed out in the water in order to see how many different bat stars would converge on a large food source, Wobber discovered that individuals that were the first to arrive would fend off the other subsequent approaching individuals. Many bouts ensued as the bat stars would clash over the food. Wobber re-visited this event in the 90s (along with John Pearse from UCSC) in this awesome video from the "Shape of Life". They compare the behavior of bat stars to that of the most aggressive of African predators. 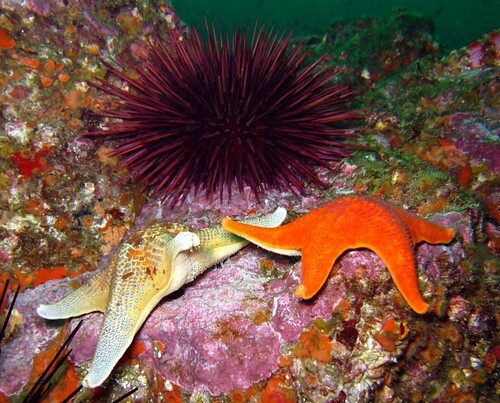 A primary "alpha dog" starfish stakes his/her claim on the food and proceeds to "bout" with all the challengers. And there's MORE! If you look closely at the many, many Antarctic Odontaster penicillatus in this classic BBC time-lapse video you can observe the "bouts" between different individuals interacting among one another. So..this week's take home messages! Not enough neural connections to get something done fast? No worries so long as you drop the 'fast' requirement apparently. Fast and slow can be relative perceptions can't they? Its a different way of life.